“Designing is about feeling, and believing in it. You simply can’t say you want to design something that is timeless. 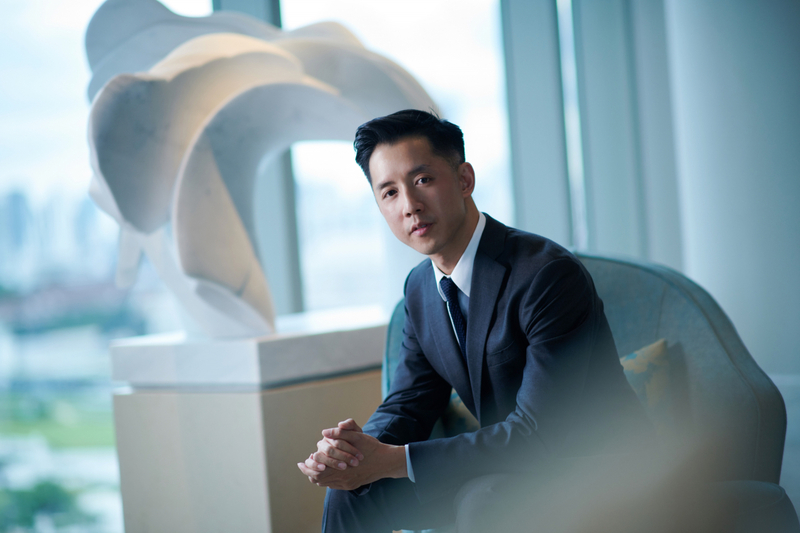 It’s not about responding to what’s fashionable but about establishing something that’s from the heart.” These words are aptly spoken by award-winning architect and designer wunderkind André Fu, whose works are best known for their quiet elegance. He shot to fame with The Upper House in Hong Kong — the property impressed with its tranquil, modern Oriental design that merged bamboo and natural timber elements. Closer to home, Fu’s works of The Fullerton Bay Hotel and Andaz Singapore are also notable additions to the city’s skyline. At the debut of Waldorf Astoria Bangkok in Bangkok in October, Fu explained his design of the Thai property. His style — which he describes as a new hybrid of “East-meets-West aesthetics” — is echoed in the hotel’s blueprint that honours the Waldorf legacy, and the city’s Thai traditions. “For me, it is about combining a seamless alignment of cultural and design sensibilities, modern luxury, and craftsmanship to shape the world around us,” says Fu. With a new book in the pipeline that will showcase his and his design studio AFSO’s achievements, the architect opens up on what inspires his work and the future of luxury hotel design. How did you begin as an architect? As a child, I loved drawing and used to draw crazy mazes which my classmates would work on. I remember back in the day, the most aspirational thing in Asia was hotel dining for occasions and such. I loved going into hotels, and seeing them; a new hotel opening was an escape from the everyday. Eventually, I pursued my studies in architecture and now my main focus is on architecture in the scheme of hospitality, and I deal with product designs, pop-ups and fashion as well. When I get a project, I typically spend time talking to the client to try and understand their vision. It’s important to build a rapport with them through conversation. Then, when I arrive at the hotel, I look at everything that’s offered in the city including its historical aspect. If I have friends living there, I try to observe their way of life. I also examine the brand to understand its origins, or the memories they trigger for others. There are many layers that influence how I approach a hotel project but ultimately, there is no real formula. It’s quite organic. I call it a mental collage. Many things, imageries, moments and touch points will come to mind when I’m conceptualising something. Then, when I look at the layout and see the framework of the building, I try to articulate the flow around it. The picture will come into life and that’s when I will take out a pencil and start to sketch. What are the surprising things that inspire your work? Perhaps it’s linked to the idea of travel. Many people see travel as boarding the plane, going somewhere and experiencing the city. But for me the most inspiring thing is experiencing the city through the course of realising a project. I’m expressing a point of view and creating a gateway for many people to experience a particular location. They see the city through the eyes of the hotel in many regards. I find it intriguing. I’ve known many people who’ve stayed at three of the hotels that I’ve designed in different Asian cities within a week. It’s interesting to have that touchpoint and that connection with many people. Tell us your thoughts on changing luxury hospitality tastes in Asia. Luxury tastes are definitely evolving and changing. Ten years ago, people loved the formality. They loved to dress up for special wine and dine occasions. Now, people like to dress comfortably. They — like a Prestige reader — would pay a premium for a simple-looking t-shirt that is organic and beautifully made. It’s not so much the visual when you talk about luxury hotels or the superficial opulence. It’s about the heart — the essence of the experience and whether there is a thoughtfulness. Whether you can capture the spirit of the location without the expression being too literal. Take Waldorf Astoria Bangkok. We’ve woven plenty of Thai-inspired details here, but it’s subtle, like the curved metal screens that resemble the fingers of a traditional Thai dancer. At the moment, I want to design a park because, deep down, I want to be a landscape designer. Plants speak of different cultures. and sensibilities. It’s like working with materials in the interior world but real, as they evolve with time as they grow. Typically, a garden always looks better in time if it’s looked after well. There’s rarely a renovation needed whereas with interiors, you’d always need one in 15 to 20 years. What does meaningful architecture mean to you? It’s about creating places for people to be in. It’s not so much about an expression of personal or spatial vision. I think of the person in mind. If I’m working on an art space, I always think of how the spectator feels when they enter an the gallery and how the rooms of different proportions inspire the artist to do very different things. I like that interaction with the person. Any tips for aspiring architects? In my industry, it’s a difficult time as information gets transmitted very easily through social media. Consumers are very well informed about what’s being offered in the market as compared to 10 years ago. In terms of design it’s become even harder because a project like mine takes seven years. How do you design something that can be relevant years later? Let’s look at it from a publishing angle. How do you work on something that’s relatable 100 issues later? Think about it this way too: How do you predict the Chanel show that Karl Lagerfeld will do after 20 seasons? Obviously, you can’t, so don’t look at the surroundings when you design. Instead, take in everything that’s around you. The key is endurance and believing in your design.